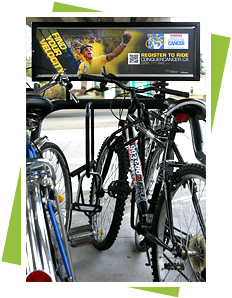 Bike rack advertising is an effective way of reaching potential customers proving maximum impact during shopping hours. Our high impact bike rack ads can't be turned off or discarded like brochures and flyers. Your ad will be the first and last thing customers see when entering and leaving the mall or shopping centre daily. Ad facings are positioned to maximize exposure to all pedestrians and vehicular traffic around the shopping centre. Visually appealing with repeat impressions extends your brand outside the mall to bring the customer inside. Advertisers can dominate specific areas to maximize brand exposure and impact. Promote corporate citizenship by advertising on our Landlord supported advertising program. The smart solution to advertising while helping promote green and alternative transportation methods. Our medium permits you to change out your ad for a new one at any time during the term of your contract. Adjust your ad to suit your needs seasonally or on a per promotion basis for the mere cost of an extra sign. We will store your ads and assist you with your media planning.